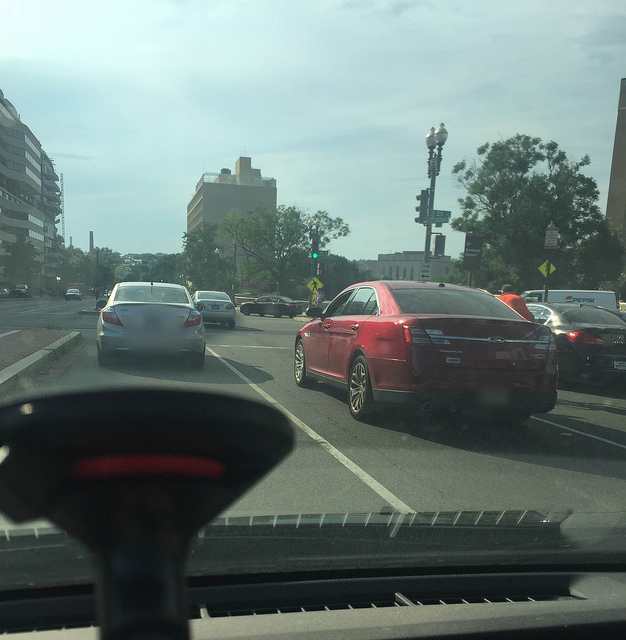 Just witnessed a silver Honda Civic Hybrid either actually hit or nearly hit a cyclist that was crossing southbound in the crosswalk while driving westbound on Virginia Ave NW near 25th Street NW (close to Watergate) around 5:40pm on 7/26. I saw the Civic slam on their brakes and then the cyclist stop and tip over, but couldn’t tell if that’s because they were hit or what. The cyclist was a young brunette woman, would guess she was in her 20s. I didn’t get as good of a look at the driver, but she had short bob of (dyed?) blond hair, and didn’t even get out of her vehicle to see if the cyclist was unharmed! Took about a minute for the cyclist to gather her things that had been strewn about the road. The she managed to finish crossing the road as she glared at the driver of the car that forced her to wipe out unexpectedly. The Civic was a few spots up and over in the left lane, but I did manage to get behind her and snap a pic of her license plate when we were still crawling. Tried to get a shot of the driver as well, but didn’t have the chance (as traffic started moving to get onto Rock Creek Pkwy). I hope the cyclist was relatively unharmed! If she wants it to file a report, here’s the pics I got of the offending driver and the vehicle. **Before folks chide me- I keep my phone in a dashboard cradle thing, so switching to camera mode and zooming for the tag is easy to do, especially when you’ve been stopped at a light already. Feel free to scold for the sideways shot of the driver, although that was done without me really looking at the thing I was trying to photograph, my eyes were on the road ahead (hence the crappy pic). Ed. Note: If you are the cyclist and want to be in touch with OP please email me at [email protected] and I’ll put you in touch.